SpaceHarp Event rentals are great for corporate events, fundraisers, music festivals, county and regional fairs, receptions, product launches, trade shows, art walks, dance parties, birthdays, weddings, block parties and more. Event guests can take turns playing. SpaceHarp will make your event the most memorable ever for its guests. Museums, science centers, resort hotels are just few examples for long-term installations of SpaceHarp Interactive Systems. These can be offered either as part of a bundled admission ticket or offered as a personal pay-per-play experience. 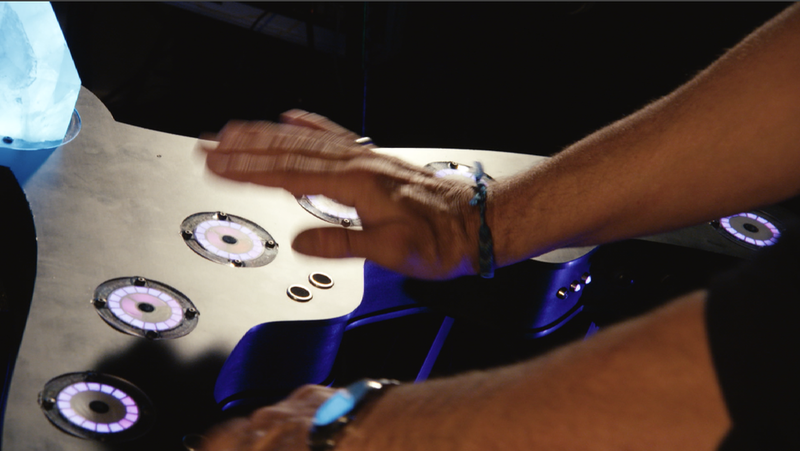 The SpaceHarp controller and Sound Galaxy DAW Tools were developed and created with the participation of EDM performers. The unique behavior of the sonar sensors’ height function combined with many effects for DAW instrument plug-ins are ideal for a dramatic, expressive and exciting EDM performance. The SpaceHarp empowers a comfortable 'flow' of creative virtuosity, unleashes new expressive powers and transparently delivers effortless precision. SpaceHarp is the world's most expressive Motion Controlled Music Instrument. The SpaceHarp represents an entirely new class of MIDI Controller and musical instrument giving players intuitive, easy access to expressive musical powers. SpaceHarp allows anyone to satisfy their dream of being an instant musician, and it does so in a way that both sounds great and delivers the satisfaction of true creative expression. SpaceHarp spontaneously provides a new kind of therapeutic and wellness experience to players.SpaceHarp has the unique feature of allowing anyone who can move to play real music, providing instant gratification while being mistake-free. The experience of playing SpaceHarp can be considered to be a combination of music therapy, dance therapy, creative therapy, physical therapy, art therapy and play therapy. SpaceHarp’s issued US patent covers a “Creative Wellness Response” which entrains players within minutes into a “desirable cognitive state” that is uplifting and empowering in every way. In our experience, thousands of trial players have reported a feeling of “euphoria” and “creative joy” after only a minute or two from starting to play, even in their first SpaceHarp session. We welcome affiliations with principle investigators for research and validation of these applications. If you are involved in any of these applications, SpaceHarp might be a solution for you! Please send us your questions using our Find Out More web form, and tell us something about your application. We'll get right back to you to explore what can work best for you and what fits within your budget.